We believe that 2019 EBITDA that could approach $37-$41mn$18-20mn in 2018. Additional acquisitions or reimbursement from claims settlements could add further EBITDA upside. At a 1-2 EBITDA turns discount to 2019 peer multiples, Limbach shares would triple. Heads, I win (a lot); tails, I don’t lose much! Limbach (LMB) is a leading HVAC company with a wide array of top-tier customers across the Commercial, Educational, Entertainment (theme parks, sports arenas), Hospitals/Medical, Industrial, and Office segments and an over 100-year operating history. It has been, and remains among our Fund’s top holdings, and has weighed heavily on this year’s performance. Today it closed at $10.65 and is down 23% year-to-date. The stock's performance makes sense, given that Limbach reduced its EBITDA guidance on it's 2Q earnings call from $20-$24mn to $18-$20mn, however we believe that the vast majority of the company is operating exceptionally well, and the issues that have weighed on the stock 1) are almost entirely in the rear-view, and 2) largely contained at this point. Given the dramatic decline in the company’s stock price, shares are now trading at 6x very depressed EV/EBITDA – levels which we believe reflect an exceptionally draconian outlook and include non-recurring expenses. Specifically, we note that guidance includes $8.1mn in write-downs associated with cost overruns in its Mid-Atlantic region. We believe many less conservative companies would have "one-timed" these expenses, and used an adjusted EBITDA number excluding these costs, in which case, 2018 would have represented a year with healthy growth and upside. If we could eliminate Limbach’s challenges in the Mid-Atlantic, the company would be enjoying a spectacular year. “If”, of course, is the operative word — after all, if pigs had wings, they’d be birds. With that as prelude, we see a path to Limbach being a $30 stock in 12 months. Importantly, this doesn't rely on vast, or even modest market share gains, additional acquisitions, or a whole lot going right. The company merely has to execute to plan and not screw up. Year-to-date, Limbach is massively underearning. On its 2Q conference call, the company stated that it has experienced $8.1mn in year-to-date write-offs. Without these write-offs, the company would be projecting 2018 EBITDA of $26-28mn, well above the company's initial guidance. We recognize that it's easy to discuss what if scenarios — Limbach did incur these write-offs. But our view is that this is a situation that can and will be remedied. We believe management has a handle on the issues, and that they won't persist into 2019. Notably, on September 20, Limbach announced the acquisition of Ohio-based Dunbar Mechanical, Inc., a $75mn in revenues construction company focused on industrial, healthcare, higher education and general institutional buildings, with a long history of partnering with Limbach. Management indicated that Dunbar has been over-earning in 2017, and 2018, but that normalized EBITDA is approximately $4.5mn, for which Limbach paid $20.2mn, or 4.5x, comprised of 402,000 shares ($4mn), $3.6mn in a sellers note, and $12.6mn in cash funded by a term loan. In addition, while potential operational and revenue synergies exist, none are relied upon in the valuation. Investors have been waiting patiently for several years for Limbach to move forward with a transaction, and we see this as something of a game changer for the company. While we don't expect the floodgates to open, it appears several may be live and relatively near-term, further augmenting the company's 2019 growth trajectory. We'd anticipate a steady cadence of acquisitions in coming quarters and years. In our view, if there are no more shoes to drop when the company reports 3Q results, shares are going higher. Conceivably, they are going considerably higher. When we look at 2019, the story becomes extremely exciting. If we assume that Mid-Atlantic expenses do not recur, we start at a baseline of $26-$28mn of EBITDA. We then assume revenue grows 5% in 2019, which we believe is exceptionally conservative when we look at a chart like the following. 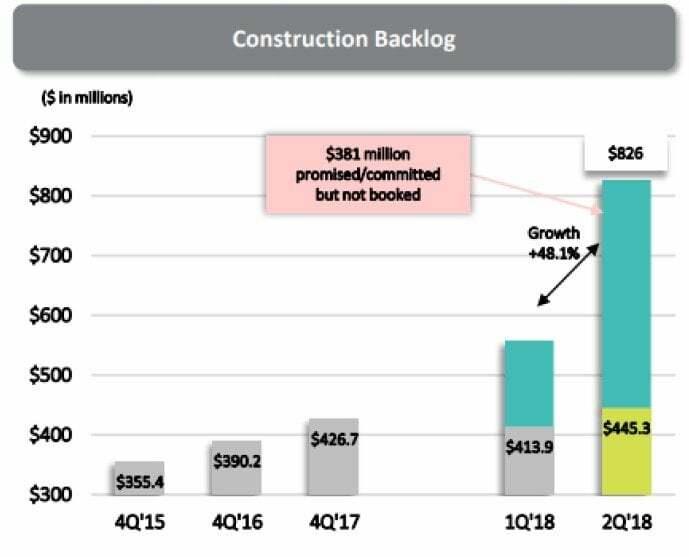 Given that backlog increased 7.6% sequentially in 2Q, while promised/committed, but not booked backlog was up an astonishing 48.1% q/q, we think 5% revenue growth in 2019, is conservative. Based on this growth, we generate $4mn in incremental EBITDA in 2019. Similarly, we believe that margins in 2019 are likely to increase substantially, given better pricing on current backlog, but we are modeling just 60bps of gross margin improvement. 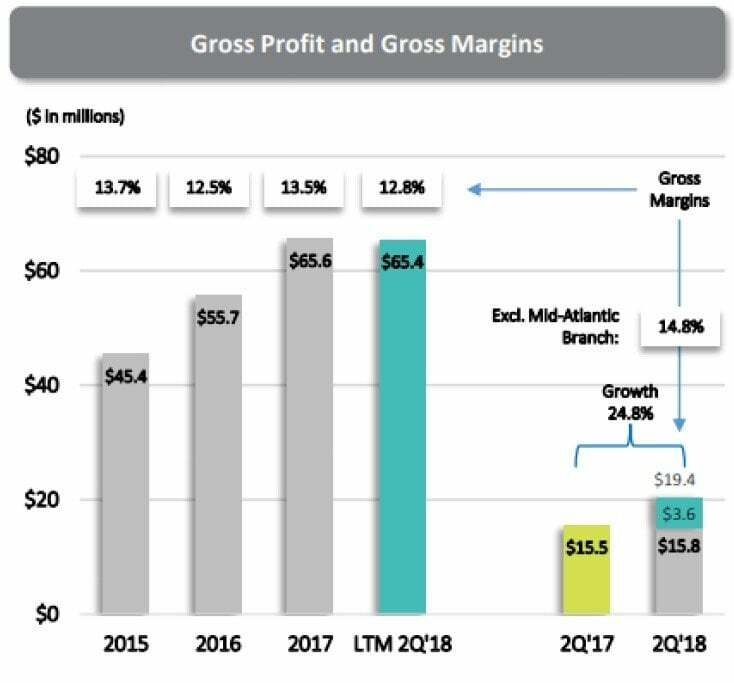 To give context, excluding Mid-Atlantic cost overruns, gross margin would have increased 160bps y/y from 13.2% in 2Q 2017 to 14.8% in 2Q 2018. Resulting in gross profit dollars that would have been up a staggering 25% y/y, all organically. We are conservatively modeling that EBITDA margins improve just 60bps in 2019 versus 2018, resulting in just $3mn in EBITDA improvement. At the midpoint, Limbach should see EBITDA grow from $19mn in EBITDA in 2018 to $39.5mn in EBITDA in 2019, if they merely execute. In the likely event that Limbach makes an additional acquisition, EBITDA would be higher. Further, it's likely that Limbach will recover some of its cost overages. While the settlements might be one-time in nature, just as they took a hit on the losses, the company should get some credit for any reimbursement. The point of all this is that Limbach hardly seems to need to do anything heroic to have a much, much better year in 2019 than in 2018. At its current price, Limbach appears to be left for dead and a huge bargain relative to peers. We note that in the above, we include Dunbar, and its contribution to share count, debt, and EBITDA in our 2019 estimates, but exclude its impact in the conservative case if for some, high unlikely, reason the transaction does not close. The growth, and massive valuation disconnect, in the modest growth scenario, is striking. We remind readers, that NV5 (NVEE) was a sub-$30 million enterprise value company that went public 5 ½ years ago, which now commands the premium multiple in the sector and sports a market cap in excess of $1 billion. We'd suggest, that in terms of business similarities, Comfort Systems (FIX) is most similar to Limbach. At a 7-turns discount to Comfort Systems, despite magnitudes more rapid anticipated growth, Limbach is at a tremendous discount. 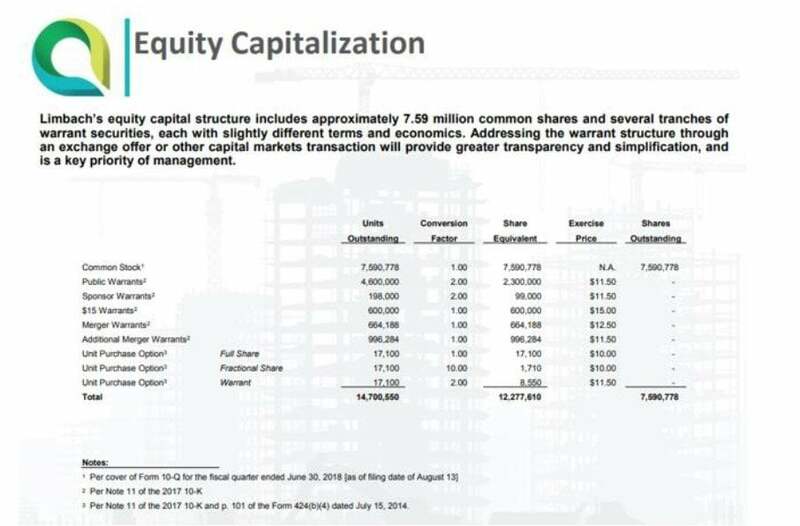 Given the moving pieces to Limbach's capital structure (specifically, multiple tranches of outstanding warrants) the below table shows share count and EBITDA multiple at various stock prices. Please note that in the above, we are including all the incremental shares and debt from the Dunbar acquisition in 2018, without giving any of the associated EBITDA benefit. As the above illustrates. without significantly stretching valuation - and with valuation still at a 1-2 EBITDA turns discount to peers, shares could triple from current prices. We note that we stop growing public warrant share count when the stock hits $24 because that's the price at which Limbach can use its right to a cashless conversion. However, we believe that it's likely that Limbach will address its outstanding warrants far sooner, and use some type of exchange offer for stock in the relatively near-term. If we were management and believed in our company's future, as we believe Limbach does, it would be far less expensive and dilutive to eliminate warrants before the stock appreciates, especially if the potential for appreciation is dramatic, as we've outlined. We also believe that simplifying the capital structure will increase the number of potential shareholders who will be attracted by greater transparency and a simplified capitalization structure. Management has been increasingly emphatic about simplifying its capital structure and included the following slide in its most recent investor presentation. Economic slowdown - Limbach's fortunes, like those of its competitors, are closely tied to the strength of the broader macro-economy. According to the FMI S. Construction Outlook Second Quarter 2018 Report, 2018 construction accelerated from 2017, and the period of 2017-2022 is generarally expected to be robust, with a CAGR exceeding 2017 levels (see page 24 of Limbach's September 2018 investor presentation for raw data). That being said, if economic expansion slows, Limbach is likely to be adversely impacted. Mid-Atlantic woes continue - We are optimistic that Limbach has addressed its troubles in the Mid-Atlantic. Management has commented to us that they anticipate positive EBITDA contribution from the region in 2H 2018 and in Should this not be the case, it would likely negative imact Limbach's results. We believe it is probably that Limbach will recover some of its losses in claims settlements, but that is not baked into our forecasts. Inability to complete M&A - We are optimistic regarding the positive impact Dunbar will have on Limbach's operating results and on investor perception about the Should the acquisition fail to close or if Limbach is unable to close future transactions, that would likely have a negative impact on investor stock price and gate share price appreciation. To summarize, we believe that virtually any scenario other than a disaster when Limbach reports 3Q will result in shares moving higher (if things aren't getting worse, they're going to get better). A 2019 which is flat from what 2018 would have looked like, plus the Dunbar acquisition, should result in significant stock price appreciation. A 2019, with growth, margin expansion, and Dunbar, could easily result in a doubling or tripling of shares without valuation becoming extended. 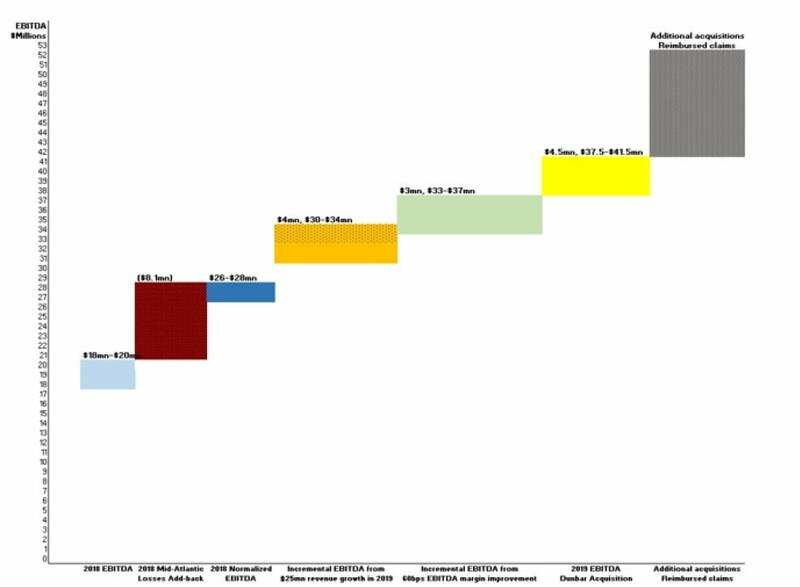 And additional acquisitions, positive settlements on cost overruns, a warrant exchange (public 1/2 warrants trade under LMBHW), and growth beyond our forecasts could result in far greater upside. We don't see a likelihood of much if any downside from here and believe the risk/reward is highly asymmetric. Disclaimer: This article was provided for informational purposes only. Nothing contained herein should be construed as an offer, solicitation, or recommendation to buy or sell any investment or security, or to provide you with an investment strategy, mentioned herein. Nor is this intended to be relied upon as the basis for making any purchase, sale or investment decision regarding any security. Rather, this merely expresses Dane's opinion, which is based on information obtained from sources believed to be accurate and reliable and has included references where practical and available. However, such information is presented "as is," without warrant of any kind, whether express or implied. Dane makes no representation as to the accuracy, timeliness, or completeness of any such information or with regard to the results to be obtained from its use should anything be taken as a recommendation for any security, portfolio of securities, or an investment strategy that may be suitable for you. Dane Capital Management, LLC (including its members, partners, affiliates, employees, and/or consultants) (collectively, "Dane") along with its clients and/or investors may transact in the securities covered herein and may be long, short, or neutral at any time hereafter regardless of the initial recommendation. All expressions of opinion are subject to change without notice, and Dane does not undertake to update or supplement this report or any of the information contained herein. Dane is not a broker/dealer or investment advisor registered with the SEC, Financial Industry Regulatory Authority, Inc. ("FINRA") or with any state securities regulatory authority. Before making any investment decision, you should conduct thorough personal research and due diligence, including, but not limited to, the suitability of any transaction to your risk tolerance and investment objectives and you should consult your own tax, financial and legal experts as warranted.